Justice Brett Kavanaugh seems to be keeping a low profile in his first months on the U.S. Supreme Court after his bitter confirmation inflamed much of the public and recast the 2018 elections. 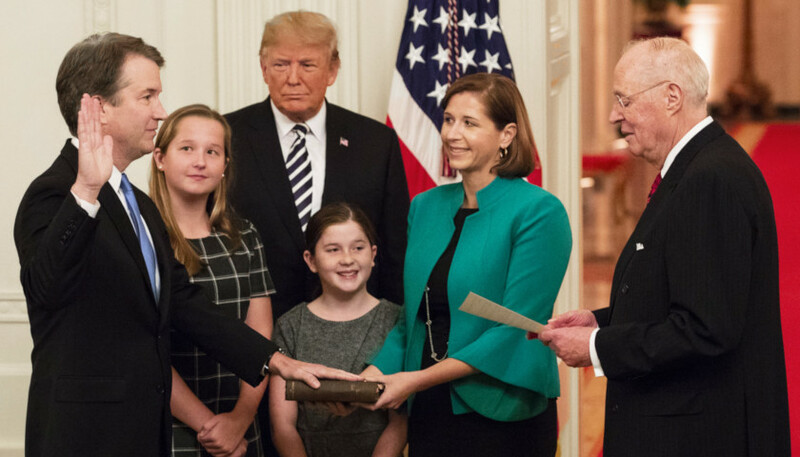 The new justice’s approach to his first months on the high court is in marked contrast to President Donald Trump’s other appointee, Justice Neil Gorsuch. The justices have done their best to project normalcy since Kavanaugh’s confirmation. The panel was especially lighthearted during his first day on the bench, as when Justice Sonia Sotomayor turned and pinched Gorsuch while posing a hypothetical about the term “violent felony” within the meaning of a federal sentencing law. Gorsuch reacted with good-natured surprise, eliciting laughter from the courtroom audience. Kavanaugh himself has been an understated presence at oral arguments, clearly engaged but deferential to his colleagues. As a general matter, he has waited for the other justices to ask their questions before posing his own, and his inquiries have been largely confined to technical matters. He did, however, appear to break type in a Nov. 6 death penalty case, signaling concern that Missouri’s death penalty protocol could inflict “gruesome and brutal pain” on an elderly convict. Kavanaugh was missed outside the Supreme Court following his investiture on Nov. 8, which drew Trump, among other dignitaries. Though the new junior justice traditionally appears in the marble plaza for pictures with the chief following the ceremony, the high court cancelled the photo opportunity in view of unspecified security concerns. Over one thousand demonstrators rallied outside the Court following his confirmation on Oct. 6 — some scaled statuary and attempted to pry open the bronze doors which open on the Great Hall, as Kavanaugh took the oaths of office inside. Trump’s visit for Kavanaugh’s investiture didn’t even rank as major news coming from the Court that day. Just moments before the president’s arrival, the Court’s public information office announced that Justice Ruth Bader Ginsburg had been admitted to the hospital after falling in her chambers and breaking three ribs, prompting waves of liberal anxiety about the otherwise spry justice’s health. Kavanaugh’s first public foray came over a month after his confirmation on Nov. 15, when he attended a glittering Federalist Society gala in Washington’s Union Station, drawing a sustained, standing ovation. The dinner, which opens the Society’s annual lawyers convention, is the marquee social event for the conservative legal establishment, where hundreds of loyalists and luminaries fete the Society’s achievements. Gorsuch delivered the keynote address at the 2017 dinner, and drew thunderous applause for taking up the mantle of his predecessor, the late Justice Antonin Scalia. Speculation abounded that Kavanaugh, following Gorsuch, would deliver his own victory oration, particularly since the Society did not disclose the evening’s speaker until Thursday morning. Instead, he followed a quieter course, attending the dinner while not participating in the official program. Kavanaugh has broken with Gorsuch in another, more important respect — where Gorsuch was bold and assertive in his first months on the bench, Kavanaugh has been more circumspect. Gorsuch joined the high court in April 2017, with just two months of business left in the term. In that short period, Gorsuch wrote seven separate opinions, an unusually large body of writings for a new junior justice. These included concurring opinions — in which he voted with the majority but disagreed with a portion of the holding — and dissents from the Court’s refusal to take up particular cases. The Second Amendment, LGBT rights, and public funding of religious institutions were among the topics he addressed. By contrast, Kavanaugh has yet to produce a single opinion, nor did he join his conservative colleagues when they broke with the other justices over two high-profile petitions. The Trump administration is currently defending the addition of a citizenship question to the 2020 census questionnaire at a federal court in Manhattan. U.S. District Court Judge Jesse Furman, who is presiding over the case, issued a sweeping discovery order allowing the plaintiffs to depose senior administration officials, including Commerce Secretary Wilbur Ross and an acting assistant attorney general. The Commerce Department oversees the U.S. Census Bureau. It is extremely rare for judges to permit depositions of cabinet officers. The U.S. Department of Justice appealed Furman’s decision to the Supreme Court, which stopped the Ross deposition on Oct. 22. Gorsuch wrote a separate opinion which argued the Court should have gone farther and stopped Furman’s expansive discovery order in its entirety. Justice Clarence Thomas joined that opinion, though Kavanaugh did not. Almost two weeks later, on Nov. 2, the high court denied the government’s bid to stop the trial altogether. Thomas, Justice Samuel Alito, and Gorsuch noted their dissent, but Kavanaugh declined to join them. Though Kavanaugh’s tenure is still in its infancy, in totality his behavior keeps with his public commitments to collegiality and institutionalism — and the diminished attention that inevitably follows. “The Supreme Court is a team of nine, and I will always be a team player on the team of nine,” he said during a ceremonial swearing-in at the White House. Kevin Daley is a reporter for the Daily Caller News Foundation. Follow Kevin on Twitter.